Paulo DYBALA, Gio SIMEONE and Alejandro GOMEZ all scored in Serie A this week. DYBALA’s ending 2017 in style. Lots has been said about the jewel’s recent form. 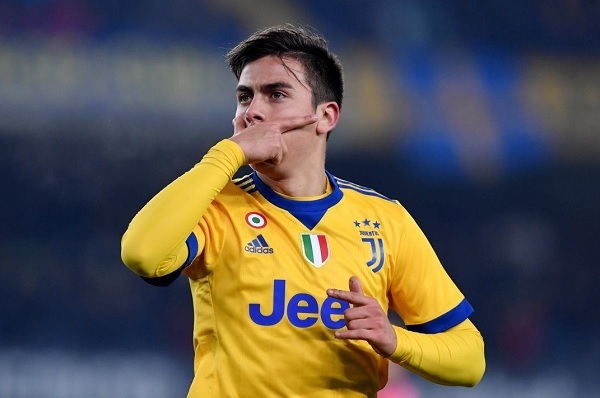 He had not been a regular starter recently for Juventus which has sparked transfer rumors but a start on Saturday saw the old Paulo DYBALA return to form. With the score at 1-1, Paulito scored a brace for the Old Lady in their 3-1 win against Verona. The win keeps Juventus in second place at 47 points, only one point behind Napoli who at 48, top the league. DYBALA’s first goal came from inside the area after a low cross was played in and an off balance DYBALA scores with his weaker, right foot. The second goal was pure magic by the Argentinian. A fantastic dribbling run right through the Verona back line and another goal with his right foot put the ball past the goalkeeper. Another young Argentinian striker scored as Gio SIMEONE was on the scoresheet for the sixth time this season as Fiorentina drew 1-1 against AC Milan. Argentinian international Alejandro “Papu” GOMEZ will try to continue to impress coach Jorge SAMPAOLI to try and secure a spot at the World Cup. His performances last season got GOMEZ into the team and maybe the goal he scored for Atalanta in their 2-1 loss to Cagliari will help. Gomez what a player! Lot of competition for 2 places of wingers in the NT: Di Maria, Gomez, Acuna, Pavon, Salvio, …etc. Its strange that Leonardo Paredes hasn’t been started at least one of the Last 2 friendlies we had, But Lo Celso(One of my favorite young players)did,thats Strange .Paredes looks very good at breaking Lines, And is very good in Long range passing ,sprays the ball around well too.He should have been tried in Last friendlies. The fact against Paredes is Sampa already had mentioned somewhere that he don’t know which position suits Paredes. Thats stranger. He is a Deep lying play maker is int it. Damit he should have moved to a higher league club or should have stayed at Roma. To me slightly different profile. Lo Celso is more versatile, he can play in all position of the midfield and he can switch from one to another during the match without any apparent effort. Paredes is not a pure DM but he prefers to stay deep in order to use his long range passing, a bit static, which is a different style of midfielders that Sampaoli wants. But to me, I would like to see Kranevitter-Paredes-Lo Celso or Pastore. That will be great. Well either Lo Celso or Paredes i think one of them will be in the WC 23. I like both but Paredes is little more experienced and more relaxed, can dictate the play from Midfield, His long range passings are very good. Moving forward after the WC would like to see Lanzini-Paredes-Ascacibar-Lo Celso combo. 2018 is here and just few more months for the world cup… yuhu!! Vietto wants to move to Valencia instead of Sporting Lisbon. The two Spanish teams are negotiating about Vietto’s future.